Tomorrow is August's first day of kindergarten and so, today I drove the seven hours down from Seattle to visit for the big event. True to form, August's mother did her best to sow mayhem, but we seem to have weathered the distraction and frustration, he and I. That was facilitated greatly by a dip in the pool here where we are staying. And on our way to pizza tonight I chatted with August about how I talk to him when he is not around, and how I talk to Doug on the phone and how I talk to Jeff, making sure he watches out for his brothers. And August listened more or less in disbelief, for a while. But he is intrigued when I tell him his brothers care for him and watch over him. And they do. Later in the pizza joint, between gulps of root beer, August said "I remember every thing you tell me." 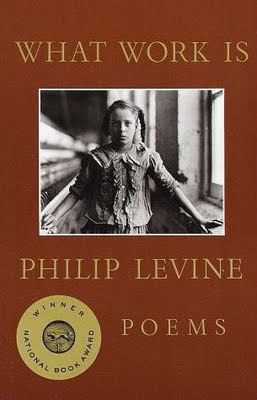 * From: Phillip Levine. What Work Is (Alfred A. Knopf, 1991). Thanks for posting the poems! Hey, it's none of my business but driving from Seattle to Humboldt County in California is some damn fast driving. Slow down, man. I love reading your blog and would hate it if anything happened to you.